Then there's all the other stuff. 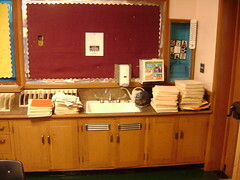 I was so disgusted with the manipulative clutter from last year's math adoption, that I finally cleared out hundreds of manila file folders from a file cabinet, looking for storage space. Those files had been there for years. Somebody gave them to me, and I had never used them. Unfortunately, the manipulatives I put in those drawers reflect a pedagogy that is so outdated, it's hard (for me) to see any progress in the process. Exchanging one outdated way of doing things with another... Oh well. Less clutter is something. Can't wait to hear more about your journey: successes/challenges with the XO solar panel. What grade are you teaching? jepcke, I'm lucky enough to be teaching third grade, and I will certainly keep up the XO news coming here! 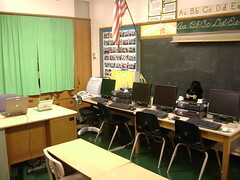 Thanks for the pictures of your classroom set up Mark. Always great to even have a small window into someone else's world. "Unfortunately, the manipulatives I put in those drawers reflect a pedagogy that is so outdated, it's hard (for me) to see any progress in the process." I've found manipulatives to be extremely valuable in introducing mathematical concepts to some kids. Are you disgusted by all manipulatives or the Everyday Math manipulatives in particular? Tyson, a poor choice of words on my part, sorry - and thanks for bringing it to my attention. A better stamenent would be: "...the manipulatives I put in those drawers are part of a program that demands a pedagogy that is so outdated..."
I am getting to this post a bit late, as I have been unplugged since the craziness of school has begun. I do want to ask a question of you in regards to that math stuff- how much flexibility do you have to teach math the way you want to? I have read your blog for a couple years, and I feel like we have some things in common, including how we choose to tackle third grade- I am just really feeling the squeeze of comforming to adopted programs this year, more than ever. I am wondering if you have any tips or words of wisdom for me as I am feeling a bit like giving up the fight at this point. Thanks! Oh vejraska, do hang in there. Please. Just the fact that you are out here looking for information off the beaten path, that you are questioning teacher-proof curricula - tells me that you are a person who absolutely should be in a classroom. I do not have any flexibility when it comes to the math curriculum. Do it their way. Period. How do I deal with it? Well, it's darned near impossible. It is so demoralizing and demeaning at times. But I do it. I have to. I think what actually gets me through some hard times is investing mounds of my creative energy in curricular areas that are not (so far) scripted. Like writing. Think my kids know this, can feel the passion of their teacher when it comes to writing and blogging? Of course they can - and it gives me at least one area in which to inspire my kids. Which is my job.